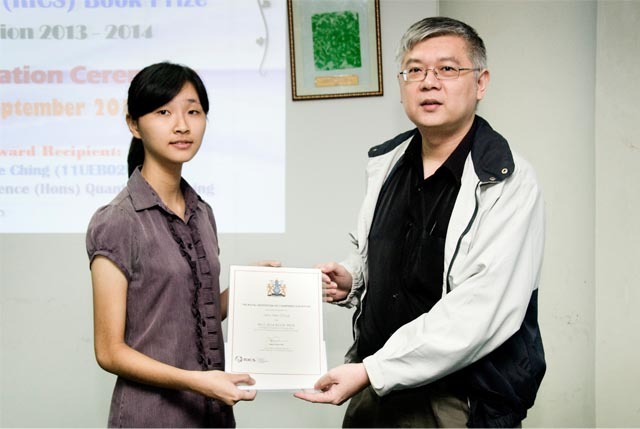 The Faculty of Engineering and Science (FES) has organised a ceremony on 3 September 2014 to recognise the achievement of its Quantity Survey (QS) final year student Liew Yee Ching, who was awarded one of The Royal Institution of Chartered Surveyors (RICS) Book Prizes for Best Undergraduates for Penultimate Year 2013/2014. The RICS Book Prizes are awarded based on the excellence in education achieved by undergraduates registered as RICS student members, studying full time or part time in RICS accredited courses in Malaysia for the penultimate year. The RICS award was a cash prize of RM400 and a certificate. Liew received the award from FES Dean Prof Ir Dr Yow Ho Kwang at the FES recognition ceremony, witnessed by the Faculty Board members. “I thanked Dr Chia and all my lecturers who have been very patient in guiding me all this while. My sincere appreciation also goes to my fellow friends who are always by my side as we supported each other in our study,” told Liew who is the current Treasurer and Auditor of the Built Environment Society besides the chairperson to organize site visits and recruitment drive for the Society. Another recipient of the award is Heng Yong Ming from the Faculty of Green Technology (FEGT).